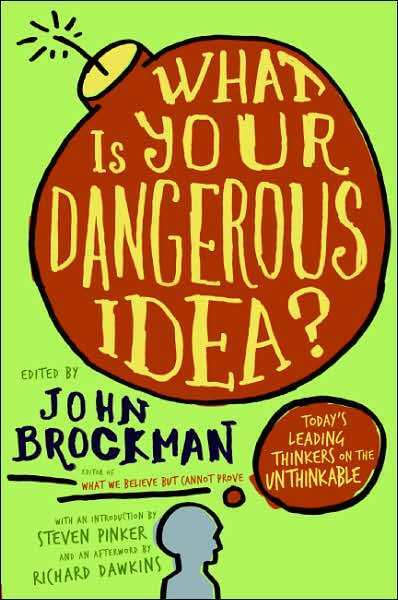 After reading This Explains Everything, I’m now a bit addicted to the Edge.org series of books, in which John Brockman poses a question to some of the leading minds in the world. I quickly went through the second and am now on the third of these books. 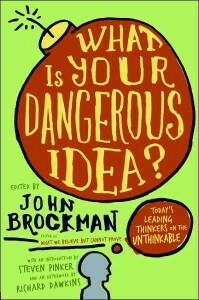 The second, What is Your Dangerous Idea?, asks exactly that question: what idea do you have or do you think is dangerous? The meaning of dangerous is in the eye of the beholder, with some contributors discussing ideas that might be coming from science that might be taken in the wrong way by politicians or those who would repress others (such as innate differences in people in terms of abilities of various sorts) to ideas that would shatter the status quo (such as the discovery of alien life or the idea that we may soon be able to control our own evolution). Most of the ideas are very interesting and, as with the previous volume I read, thought provoking. Worth a read if for nothing else than to stir the mental juices and get one thinking about ideas that might not normally cross one’s mind. However, there is one set of ideas that I found particularly striking. Other essays touch on this theme. Richard Nisbett points out how “When our behavior is insufficiently justified, we move our beliefs into line with the behavior, so as to avoid the cognitive dissonance we would otherwise experience.” The bottom line: we really don’t know how we think, why we think what we think, or where our thoughts come from. Those that do and are willing to use that understanding can manipulate us without us even being aware.